ARC Solutions had a busy year in 2016, as the partnership expanded its outreach and pursued new avenues to implement wildlife crossing infrastructure across North America and, ultimately, globally. We are grateful to the partnership for its ongoing efforts to advance ARC’s mission of identifying and promoting leading-edge solutions to improve human safety, wildlife mobility and long-term landscape connectivity. In Fall 2016, Renee Callahan moved into a new leadership role as the Executive Director for ARC Solutions. She had previously served as ARC’s Partnership Coordinator since 2011. In addition to her duties at ARC, Renee concurrently serves as Senior Policy Analyst at the Center for Large Landscape Conservation in Bozeman, Montana. Marta Brocki also joined the ARC team during 2016 as Partnership Coordinator. Based in Toronto, Marta holds a degree in Urban and Regional Planning from Ryerson University and has served as Project Coordinator of the Ecological Design Lab at Ryerson since 2013. ARC’s Technology Transfer initiative has submitted two manuscripts for publication in partnership with the U.S. Forest Service and U.S. Fish and Wildlife Service. The first paper, Highway Crossing Structures for Wildlife: Benefits of a National Commitment to Increase Driver and Animal Safety, summarizes the benefits and challenges to investing effort and funding to support a nationwide commitment to a systematic network of wildlife crossings. The second paper, Innovative Strategies to Reduce the Costs of Wildlife Overpasses, outlines design parameters and construction techniques for wildlife overpasses that could be added, changed or adjusted to reduce or avoid costs, while maintaining or improving the overall efficacy of the crossing. Representing the culmination of findings generated by two assembled teams of U.S. and Canadian federal, state, provincial and tribal experts in transportation engineering, wildlife biology, ecology, landscape architecture and other disciplines, the two publications are set to be released mid-2017. 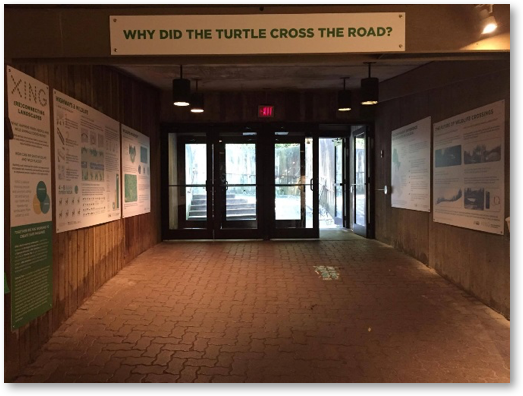 In 2016, ARC launched a permanent, interactive XING (Re)Connecting Landscapes exhibit at the Toronto Zoo. The exhibit was first displayed at Evergreen Brick Works in 2013 and has since been adapted for the Toronto Zoo’s audience. XING was designed and installed under the leadership of Prof. Nina-Marie Lister, Graduate Programme Director, Associate Professor, School of Urban + Regional Planning, Ryerson University, in partnership with the Ecological Design Lab at Ryerson. Interactive and educational content about wildlife crossings and landscape connectivity is displayed in the Americas Pavilion at the Toronto Zoo. ARC is working with the Nevada Department of Transportation, the Federal Highway Administration, and the Western Transportation Institute at Montana State University to launch a Transportation Pooled Fund Study on Wildlife Vehicle Collision Reduction and Habitat Connectivity. The study seeks to identify cost-effective solutions that integrate highway safety and mobility with wildlife conservation and habitat connectivity. In addition to Nevada, Arizona and California have already joined. Funding for a 3-year partnership development grant led by ARC partner, Prof. Nina-Marie Lister, who serves as Director of the Ecological Design Lab at Ryerson University, was successfully secured through the Social Sciences and Humanities Research Council. The goal of the partnership is to develop an integrated approach for the sustainable planning, design, and implementation of crossing infrastructure to improve landscape connectivity. The partnership’s collaborative approach will culminate in “CoLaboratories” – collaborative, researched-based, studio workshops in which participants come together to apply, present and share emerging research in the design of new solutions for human and wildlife mobility across urbanizing landscapes. ARC is one of seven grant partners, together with Evergreen Brick Works, the Toronto Zoo, Miistakis Institute, Toronto & Region Conservation Authority, and the cities of Toronto and Edmonton. Just east of Wells, the Pequop Mountains form the southern terminus of the longest mule deer migration in Nevada. Spending summers near Jarbidge, the herd begins its long trek to the Pequops in the fall. Faced with close to 200 reported wildlife-vehicle collisions over the past few years near where the herd crosses I-80, the Nevada Department of Transportation broke ground in March 2016 on a network of four wildlife crossing structures, including two wildlife overpasses, two retrofitted underpasses and associated fencing. ARC is working with Nevada to showcase this exemplary project by producing a documentary that will include a time-lapse of the construction phase of the project, with a focus on the overpasses, thereby enabling the public to virtually witness construction and use of the structures as they re-connect a historical mule deer migration route. Stay tuned for more information on where to view this film in 2018! 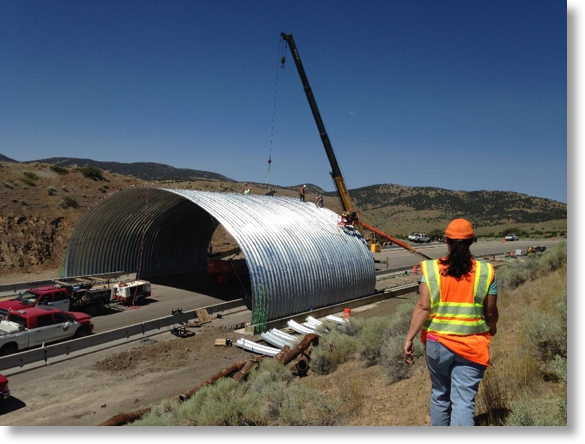 Construction of one of two I-80 wildlife overpasses near the Pequop Mountains. July 2016. Image courtesy of Nevada DOT.